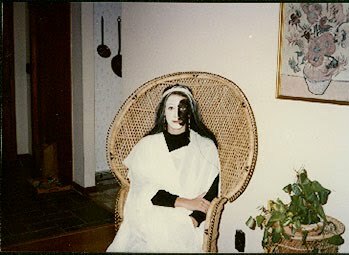 Here’s another Halloween costume photo that I found. I believe this was senior or junior year of high school? I don’t think I had a name for this one but I know that I really wanted the white make-up on half of my face to be in the shape of a quarter moon! This was a year that I re-purposed some fabric from a past year’s costume. The white drapey fabric that I am wearing in this picture was from a ghost costume that was inspired by one of my favorite young adult novels, Ghosts I Have Been by Richard Peck. The main character of the story, Blossom Culp, dressed as a ghost to expose a scam artist who came to town and claimed he could summon spirits. Anyway, she carried a candle and I carried a batery-powered, glowing pink rose instead. I was thinking last night, about how inspiring Halloween is to me. I often come up with an idea early, maybe in mid-August. This year inspiration didn’t hit until a few of weeks ago and I’m finally going to take action this weekend to get started on gathering the supplies that I need. Elaine and I are planning on driving out to a fabric store on Long Island (better deals and selection!) to see what we can find. Luckily I probably won’t need much more than some felt to add to and embellish pieces I already own! But I’m not going to reveal my costume idea right now…. stay tuned. 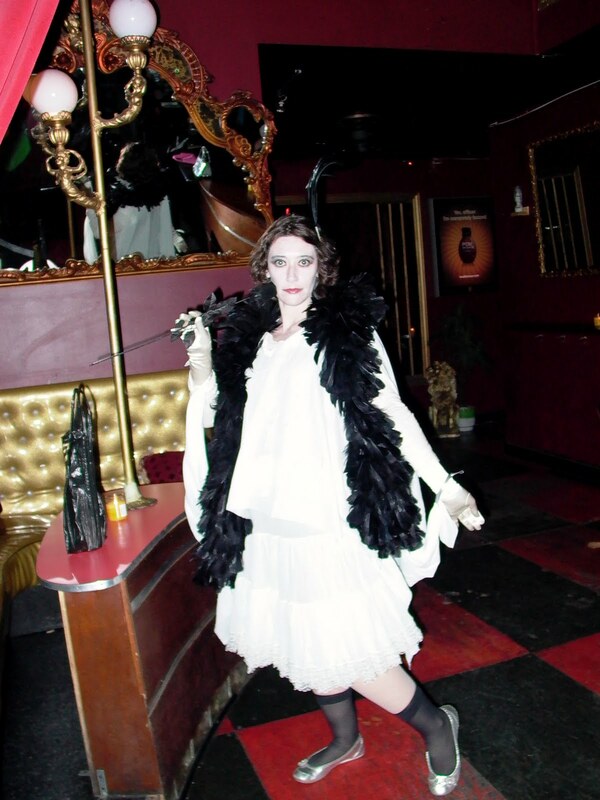 Leading up to the big holiday, I am going to try to post images from Halloweens-past of some of my favorite costumes. I might not have something each and every day, but I’ll see what I can do. It will probably continue past Halloween, too, since I’ll have to show off my creation for this year. Here’s one of my ultra-faves- Fabulous Bee! I am embodying one of my illustrated characters. Tara is dressed as Thelma from Scooby Doo! 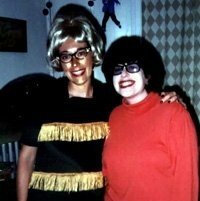 I remember that at the party we attended that night there was a group dressed as the Scooby Doo gang that did not have a Thelma! That was a hilarious moment, I definitely have a picture of that somewhere.